My family loves when I make pretzels. They love them fresh out of the oven as who can resist warm bread sprinkled with salt. 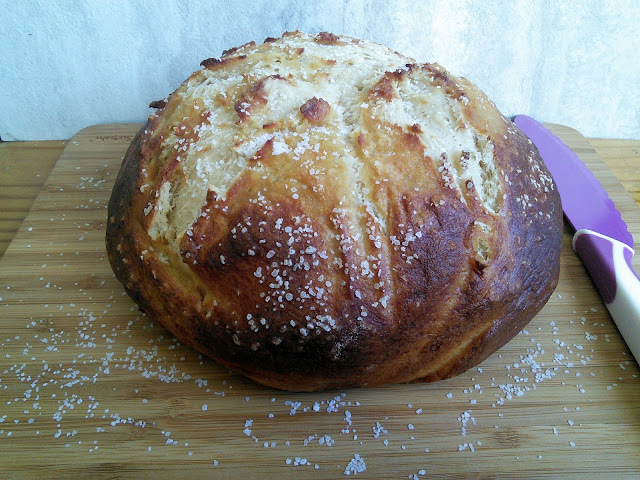 So when I saw this wonderful recipe for pretzel bread, I just had to make it. A loaf of bread that tastes like a pretzel sounded so yummy to me. This pretzel loaf would be great for making sandwiches or just eating fresh from the oven. I found this salty chewy bread so much easier to make than regular pretzels as I didn't have shape the dough into pretzel shapes. I just had to form the dough into one loaf and that was so easy to do. I find shaping dough so relaxing, how about you? I like to use my bread machine when I make bread as it makes things so much easier. I just put the ingredients in the machine and press start. The bread machine does all the mixing, kneading and rising for me. An hour and a half later the dough is ready for me to shape into a delicious loaf of bread. If you don't have a bread machine, you can just mix, knead and rise the bread yourself. 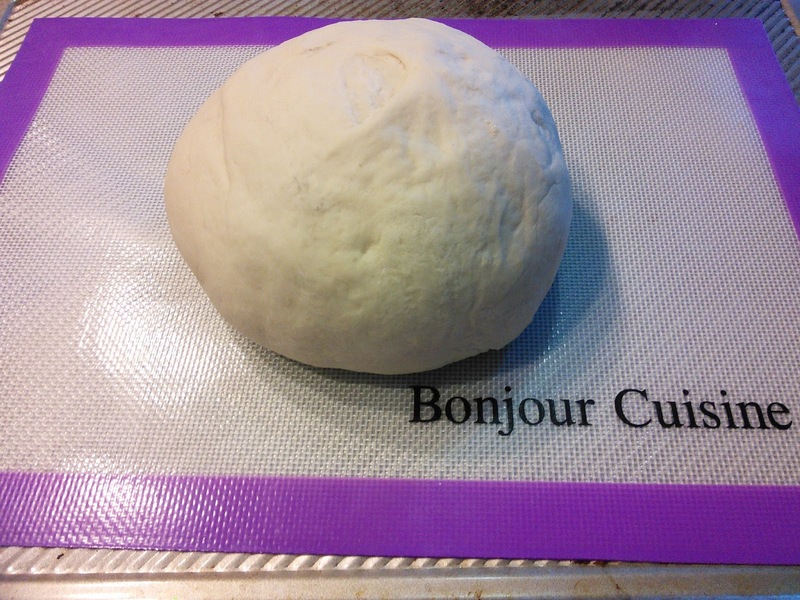 The first rise of the dough is for about an hour or until double in size. The second rise of the dough, after shaped into a ball, is much shorter. The second dough only rises for as long as it takes to boil the pretzel boil water. The first time I made this bread, I allowed it to rise for over an hour, as I had to pick up from my son from school, and my bread did not form and bake properly. It tasted wonderful but did not look nice. My husband likes when my recipes don't give me picture perfect results as he knows that I will make the recipe again. He knows that means he gets to eat the food twice. So let's begin to make the pretzel bread. Make the dough and allow it to rise. Then form the dough into a round loaf. Forming a round loaf is simple as you place the dough a baking mat and using your hands and shape it into a ball. Once the bread is formed into a ball, place it on a baking sheet that is lined with a baking mat. Then cover the dough with a damp towel and allow it to rise while you preheat the oven to 400 F and prepare the pretzel boil water. 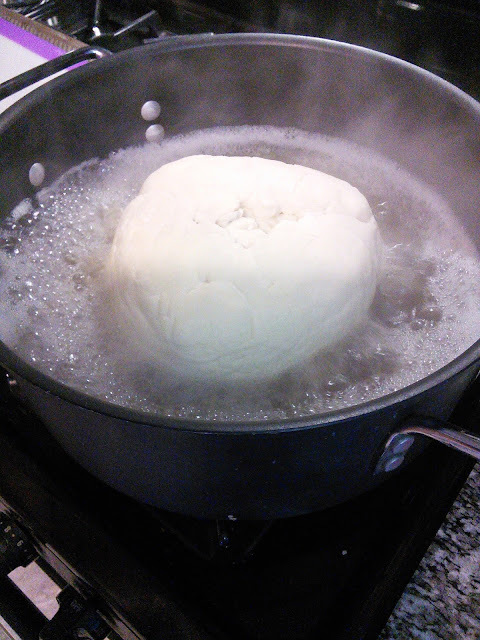 Once the water boils, make sure to place the dough top side down first. Just pick up the silicone mat to help place the dough into the water. I also recommend using two spatulas to hold the bread in the water as my bread sank to the bottom of the pan. It was hard to unstick when I had to turn the bread over in the water. I wonder if I had used a smaller pan, then maybe my bread would have not sunk. I will try using a smaller pan next time. 1. Add the water, milk, flour, sugar, yeast, and salt to the pan of your bread machine in the order recommended by the manufacturer. Select the “Dough” cycle and hit start. Allow the cycle to complete. Do not bake the bread in the machine. 2. When the bread machine is done rising the dough, form the dough into a round loaf and place on a baking sheet that is lined with a baking mat. 3. Cover the formed dough with a slightly damp towel and set aside. 4. Preheat the oven to 400F and bring 2 quarts of water to a boil in a large pan. Once the water boils, add the brown sugar and baking soda and stir. Gently lift the loaf of dough and ease into the water top side down first. Let simmer for 3 minutes and then flip the loaf over, using 2 spatulas or spoons. Simmer for 2 more minutes and carefully lift the dough out of the water using the spatulas. 4. 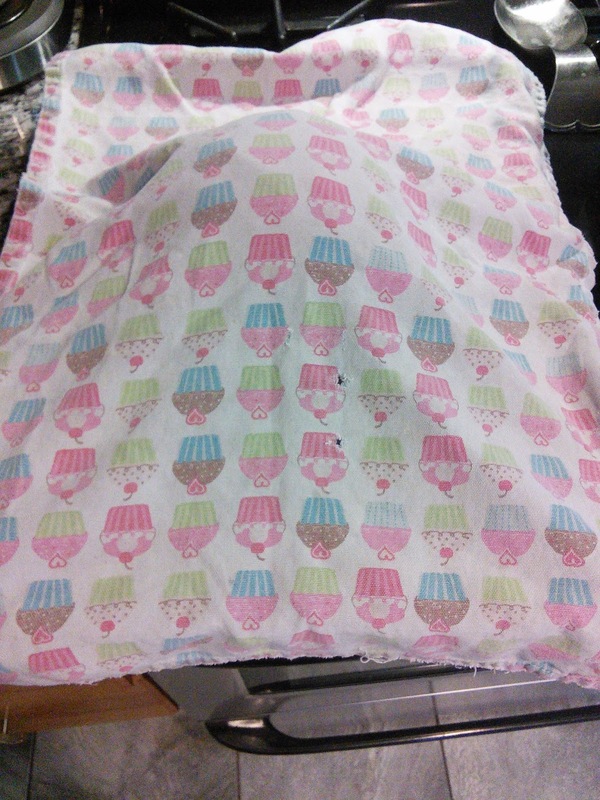 Place the dough onto a baking sheet that is lined with a baking mat or nonstick foil. Sprinkle the loaf with coarse salt. Then use a sharp knife and slice 1/4 in thick lines to form an X. 5. Bake for 35 minutes or until brown. Store any leftovers in a paper bag as plastic will make the bread soggy. 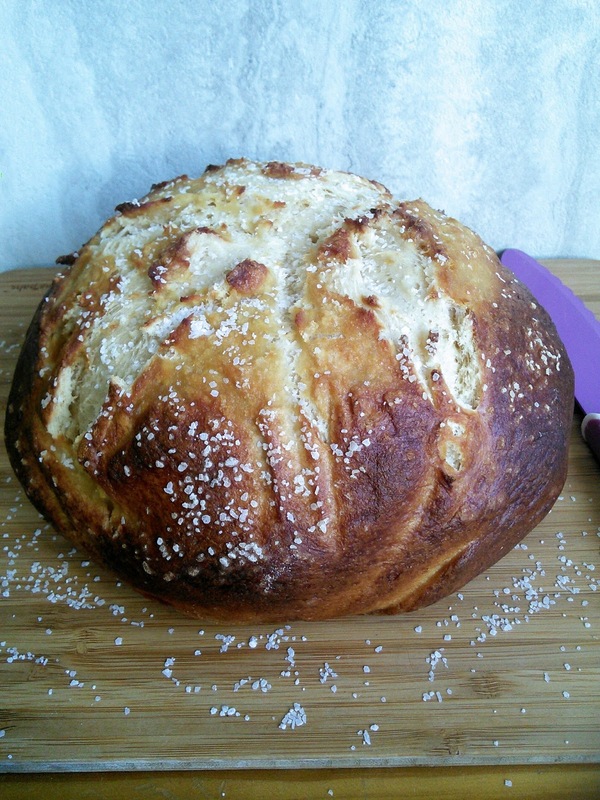 This sounds like a wholesome and delicious recipe I love pretzel bread! Can you make me some! Yum, that looks amazing! I bet this would go super fast in my home! Love bread and pretzels! Oooo, I must consider giving this a try as I so love breads! Wow that looks incredibly delicious! What a clever, clever idea! I would never have thought to make a pretzel this way. That looks soooo good, thanks for the recipe! I love pretzels and so does the entire family. It's really awesome to be able to make them at home. Thank you so much for the recipe! I love pretzel bread, but I’ve never made this. Thanks for the recipe! We love pretzels! I am not good at baking breads, but this is worth a try. Bread is my weakness. This looks so good. I have eaten pretzels before but not pretzel bread, and if I am truthful I had never heard of it before. Perhaps I will try and make some for myself. I am just getting into pretzel bread. You made it look fairly simple.